‘We see someone with a bandage or cast and we have to ask “What happened? How bad does it hurt?” Family or friends go down with an illness and we are ready with crockpots of homemade (or just opened cans) chicken soup. Someone going to have surgery and we have the florist on the line before they are even admitted to their room. We are community and that’s what we do when we see someone hurting’. This is a series of articles written by real women, about real issues that matter to them. About the highs and lows, and in-betweens of your passions, plagues and day-to-day life. Regardless of era or geography we have gathered and shared. Shared a task and often a meal. Shared the stories of our lives. Our joys and fears. Our challenges and delights. We give support one week, and receive it the next. We comfit and laugh. We learn and we heal. We do what women have always done. Now, consider the question Alycia asks next…. ‘But what if you can’t see it? What if it makes no sense to you that this person is hurting mentally just as deeply? Where is our community then? Whisper out a label of “depression, bi-polar, PTSD, PPD, etc. and the community disappears with their chicken soup crockpots or flowers. Nobody asks how bad it hurts or how did it happen, because it is something a “healthy” mind just can’t understand. So, we – the afflicted, are left with just a few choices. 1) Put on our happy smile and shove the ugly voices down. 2) Put on our happy smile and bring brownies to the PTA while our soul is crushing. 3) Put on our happy smile and drag ourselves to the doctor and downplay most of our symptoms because we don’t want to sound too crazy. There is another option though and it’s one that makes most people cringe. 4) Let’s talk about it with radical boldness and not be ashamed of our illness or belittle it into just something that will pass. 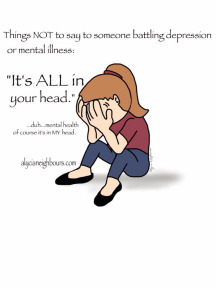 Let’s forget the community and form our own of like-minded people who get what depression is. People who understand bi-polar and know how it feels. Mothers who can walk you with you through PPD. Someone who has PTSD and has found things that have worked for them. Let’s talk about it with our doctors with such honesty that we break down and cry out for help. That’s kind of what they are there for anyway….and they can hook you up with a psychologist or psychiatrist that fits you. And when you get there, go in with the same brutal honesty. I had to have an eye exam the other day and knew strangers would be touching my face. With my PTSD this is a trigger and I got downright honest that although I knew they had to do their job, I suffered from something they couldn’t see, but was very real. I asked them to warn me when I was about to be touched and we would get through it. Guess what? They respected it and we made it through the exam with no triggers being set off. This is what talking about it does. It gives a voice to the unseen illness that devastates the victim. It’s time (heck, its way past time) that we quit whispering in the corners about what we can’t see and can’t understand. It’s time to educate ourselves about the different mental illnesses and maybe even look in the mirror. 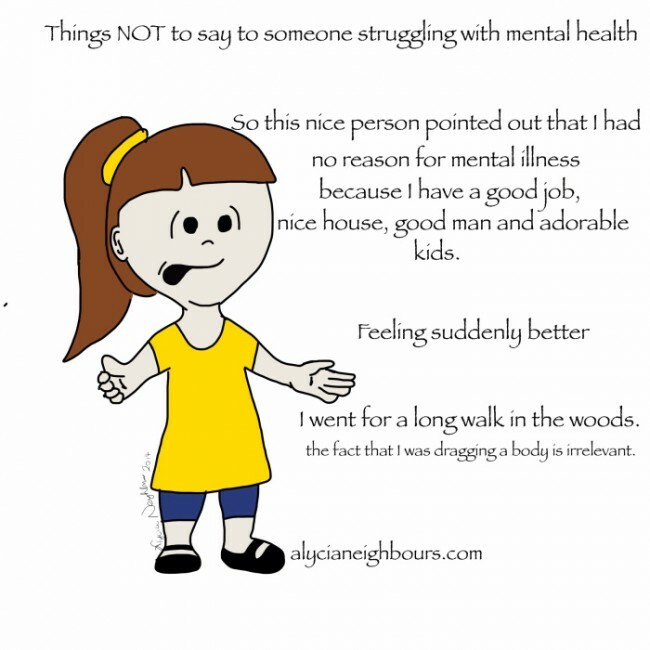 Mental illness is not going to skip you because you have the perfect life, have had no trauma or because you are a certain age, gender, race or religion. It doesn’t discriminate, but it will decimate every aspect of your life. 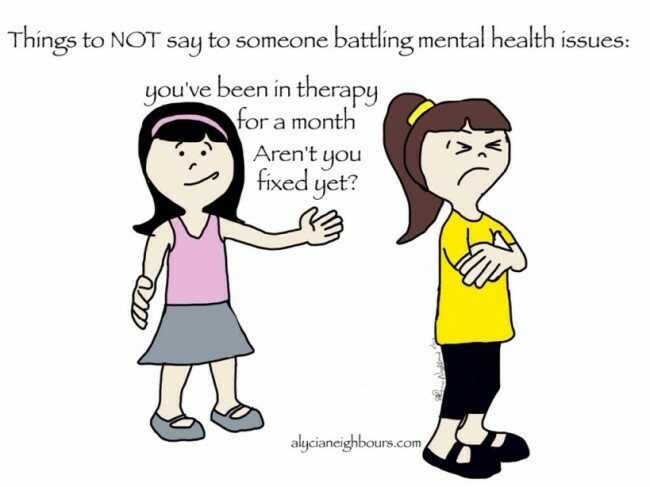 1 in 4 adults suffer from some form of mental illness….yet we still aren’t talking loudly enough, because very little is being done about it. It’s still mostly pointing and whispering judgmentally. What do we really need? A listening ear, a non-judgmental voice, educated mentors, a hug (or some space) It all comes down this, we need to know that we are not the cast-offs, the contagious, the misfits…we need to be heard loudly that this was not a choice and dang it; it hurts and it hurts deeply’. Alycia Neighbours is a published author of two ebooks dealing with grief and loss. She resides with her husband, 7 kids, 4 dogs, 3 cats, 50 fish and 1 horse. She writes in between chaos and feeding times on her blog “Walking as a Prodigal” where she talks about domestic violence, suicide, tells bible stories in a relevant way and manages to mix the horrific with the humor – because what else can you do? Previous3am: sometimes I sleep sometimes I think. NextThe Final Act: caring for my mother. What makes a beautiful woman beautiful?